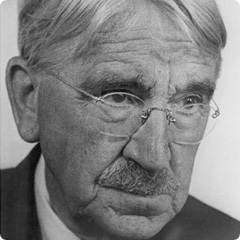 John Dewey was an American philosopher and educator, the founder of the philosophical school of instrumentalism (or experimentalism) and the leading promoter of educational reform in the early years of the twentieth century. Profoundly influenced by the pragmatism of William James, Dewey developed a philosophy in which ideas and concepts were validated by their practicability. He taught that "learning by doing" should form the basis of educational practice, though in later life he came to criticize the "progressive" movement in education, which, in abandoning formal tuition altogether, he felt had misused his educational theory.